(Nanowerk Spotlight) Harvesting energy from tiny mechanical motions such as heartbeats, breathing, footsteps and even blood flow through arteries, is an enticing prospect (read more: "Nanotechnology for self-powered systems"). Another exciting development are nano-sized generators that have piezoelectric properties that allow them to convert into electricity the energy created through mechanical stress, stretches and twists of fabrics. Such energy-scavenging fabrics could eventually lead to wearable 'smart' clothes that can power integrated electronics and sensors through ordinary body movements. Researchers have now demonstrated a new type of fully flexible, very robust and wearable triboelectric nanogenerator (WTNG) with high power-generating performance and mechanical robustness. "We applied a bottom-up nanostructuring approach where we used a silver-coated textile and polydimethylsiloxane (PDMS) nanopatterns based on ZnO nanorod arrays as active triboelectric materials," Sang-Woo Kim, a Professor in the School of Advanced Materials Science & Engineering at Sungkyunkwan University in Korea, tells Nanowerk. 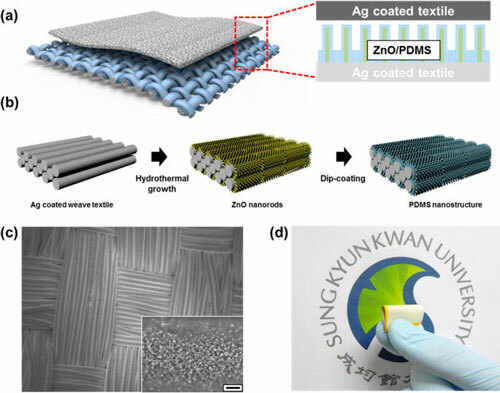 The nanopatterning was achieved by coating PDMS directly over vertical ZnO nanorods grown on the silver-coated textile substrate. "This nanopatterning promotes the triboelectrification effect by increasing the effective contact area and friction for high electrical output power and very high mechanical robustness by bottom-up nanostructuring between textile and nanostructure," Kim explains. 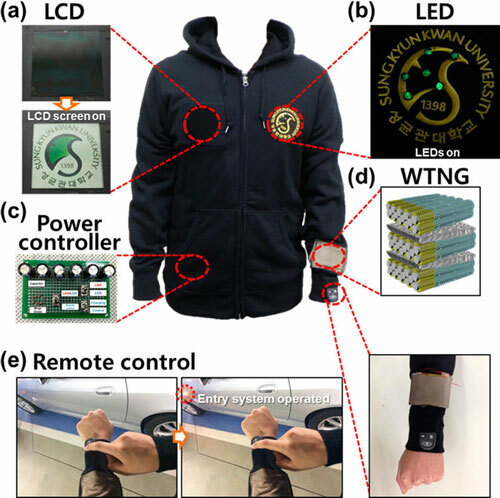 Reporting their findings in the February 11, 2015 online edition of ACS Nano ("Nanopatterned Textile-Based Wearable Triboelectric Nanogenerator"), Kim, together with collaborators from Sungkyunkwan University and the Australian Institute for Innovative Materials, successfully demonstrated the self-powered operation of LEDs, an LCD and a keyless vehicle entry system only with the output power of their WTNG without any help of external power sources (see Figure 2 below). This triboelectric power is generated when mechanical stress creates an electrical charge, which is much larger than the power generated from textile-based piezoelectric power generator reported before. This stress can arise through stretching or twisting the textile. When integrated into clothing, the WTNG relies on its triboelectric property to produce an electrical charge when pressed, and could potentially allow users to power mobile electronics such as smart watches simply by moving or walking around. In previous work, Kim and his team already have reported fully transparent, flexible, and stretchable nanogenerators ("Flexible nano-power with fully transparent and rollable graphene nanogenerators") but they were not robust enough as wearable devices. By contrast, the researchers tested a four-layer-stacked WTNG over 12000 cycles and found no significant differences in the output voltages they measured. With the previous devices, the problem was the very weak adhesion between textile and nanostructures which caused mechanical durability issues. In this present work, the researchers overcame these durability problems by bottom-up nanostructuring using ZnO nanorods and PDMS nanopattern coating. "Triboelectric generation is one of the promising new energy harvesting methods with extremely high output voltage and efficiency, low cost, high versatility and simplicity in structural design and fabrication, stability and robustness, as well as environmental friend," concludes Kim. "Recently, we have been looking to find new materials for huge triboelectrification effects which have never been reported before. Furthermore, there is a need for developing highly efficient power management systems to effectively store electric power generated from triboelectric nanogenerators into textile-based energy storage platforms such as textile batteries or supercapacitors.